As you can see, spelling generalizations can help us with selecting the correct pronunciation of a letter, or group of letters, or spelling pattern, within a word or syllable, or they can help us select the correct spelling when we hear a particular sound or phoneme within a word or syllable. 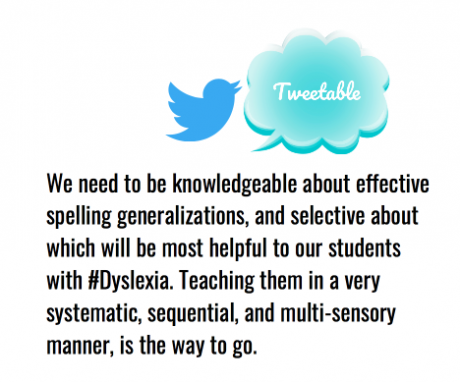 They can also help us with syllable division, and, in my previous blog on “Teaching Syllabication,” I mentioned my adaption of two syllabication generalizations that I use with my students. Marilyn Jager Adam’s quote already hints at this when she tells us, “However, they are complex, they are numerous, and almost none is 100% reliable.” Here, I’d like to quote from Emily Gibbons of the Literacy Nest, to help us fully understand our reason for talking about generalizations, rather than rules. 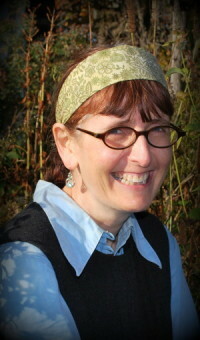 In the chapter entitled, “On Teaching Phonics First,” in Marilyn Jager Adam’s book, “Beginning to Read,” she lists in some detail forty-five spelling generalizations. These were selected by Theodore Clymer and his colleagues, from a list of one hundred and twenty one generalizations which in turn were taken from the teacher’s manuals of four widely used basal programs. The generalizations analyzed included fifty for vowels, fifteen for consonants, twenty eight for word endings, and twenty eight for syllabication. So where does this leave us? Well, it is clear that we need to be knowledgeable about effective spelling generalizations, and selective about which will be most helpful to our students. Keeping it simple for students with working memory challenges is particularly important. Teaching them in a very systematic, sequential, and multi-sensory manner, is the way to go. You are probably asking which spelling generalizations are worth teaching and in which order? If you are using a Orton-Gillingham based scripted program, that will likely be dictated by the program. However I have deliberately selected a particular program for parents to use at home, with their children, because it has less of an emphasis on spelling generalizations. This way I can be selective about the few that I do include. The generalizations I do use, and the materials I use to teach them, can be found in the Basic Language Course (Level 1) training provided by Orton-Gillingham Online Academy (OGOA.) These include the syllable types, Floss Rule (ff, ll, ss, zz), Soldier Rule (ck, tch and dge), some plural rules, y as a vowel, Stick Vowel Rule, and the Doubling Rule. There are one or two others I have included from other sources because I have found them beneficial to students. They are referred to as rules when they are introduced in the OGOA training, so I am doing the same here to avoid confusion. Like Emily, and with more knowledge in this area, I’m now moving towards discussing them as generalizations with my students, even if the word “rule” is included in the name for a particular generalization. When laying the Orton-Gillingham foundation for my students before they start on any kind of scripted program, I decided there was one spelling generalization that would be useful as soon as I had introduced the letters ‘c’ and ‘k’ to them. In fact, if I don’t explain the generalization, they often ask me when they should be using a ‘c’ or ‘k’ at the beginning of a word. As a teaching tool, I have developed a Cat/Kite Rule game, which is available as either a budget version or a deluxe version. 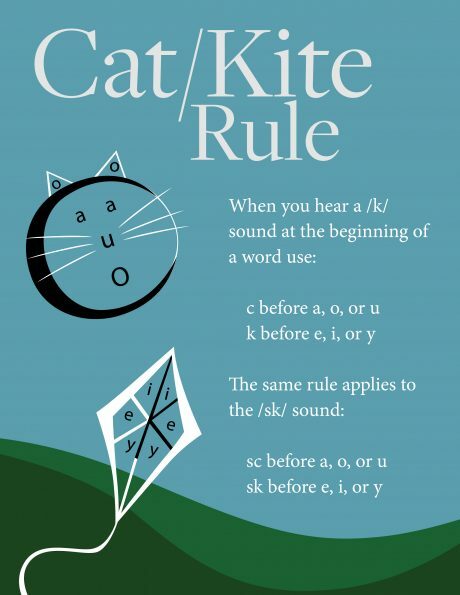 You can also download a free Cat/Kite Rule Visual, which you are very welcome to print out and use with your students. 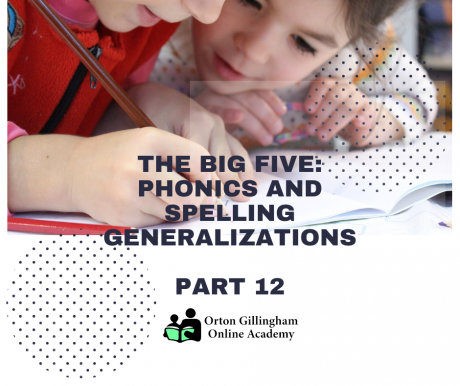 Emily Gibbins of the Literacy Nest has written a number of blogs on this topic of spelling generalizations that I will share here as well. 3. Spelling Words With /CH/: Is it CH or TCH? 4. Spelling With Long ‘A’ Vowel Teams: Is it AI or AY? If you are looking for ways to informally assess a student’s knowledge of the spelling generalizations and how they apply to reading, you might be interested in checking out my “Informal Assessment of Reading Deficits” webinar. It is from such results you can tell whether a student has knowledge of the correct pronunciation of a letter, or group of letters, or spelling pattern, within a word. Finally, I will return to Marilyn Jager Adams from her book, “Beginning to Read,” to conclude this blog on spelling generalizations.